The Sequim Community Warming Center can continue to keep individuals warm this season after it found a new home at St. Luke’s Episcopal Church in Sequim. The Warming Center’s previous location wasat Serenity House’s Sequim Resource Center in downtown Sequim. Serenity House officials decided to move the center and use the Sequim space for other uses. temperatures are predicted to drop to 36 degrees or below. “We’re very fortunate in having such a nice place,” Pratschner said. The lower level of the church can be found on the side of the building down an ADA-compliant ramp, which Pratschner believes is a plus. The new space is about 1,200 square feet with a large seating area, a kitchen and bathroom. There will be a television and games available for individuals to stay entertained while they get warm. The center could open as soon the National Oceanic and Atmospheric Administration predicts 36 degrees or below in its forecast. Pratschner said the center needs about 40 volunteers to operate the center this season. She said there is an opportunity for a paid position to be a staff monitor for the center working a 10-hour shift, 9 p.m.-7 a.m. and will trained by OlyCAP. Pratschner said the center also is in need of several donations this season, including clothing, food and money. The center will donate warm clothing items again this year to individuals in need, but this year will do it in the form of an exchange. She also is asking for food donations to provide snacks and warmed up food for hungry individuals. 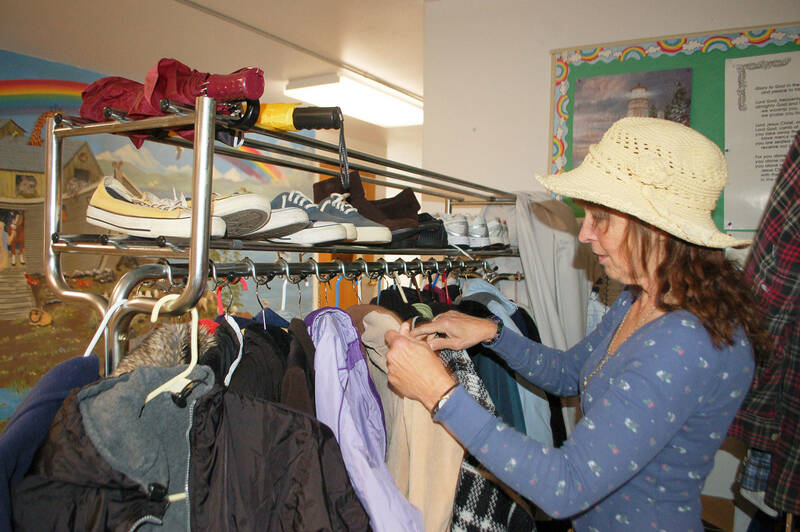 The center also could use warm weather gear and equipment donations such as tents and tarps, duffel bags, backpacks and more, for individuals who need something to carry their personal belongings. It costs about $150 each night the center is open, Pratschner said, covering one paid staffer, insurance and utilities. She said the center is in need of monetary donations as well. “We always need donations to keep the center open,” Pratschner said. Pratschner said the center’s “wish list” items this year include: rain ponchos, warm jackets (for men and women), hoodies, winter hats, mittens, socks, boots, shoes, hand and toe warmers. Food and kitchen items the center needs include: non-perishable food, soup, chili, cereals, oat meal, coffee, juice, vegetables, protein bars and snacks, popcorn, cocoa, dry milk, water bottles, sandwich bags, cups, paper towels and feminine products. Warm weather gear and equipment needed include: umbrellas, tents, sleeping bags, tarps, backpacks, duffel bags, trash bags, flash lights, reusable water bottles, vouchers for showers and the laundromat. For individuals interested in becoming a volunteer or in a paid staff monitor position, contact Pratschner at 505-264-0278. Checks also can be mailed to OlyCAP with attention to: Sequim Warming Center, 823 Commerce Loop, Port Townsend, WA 98368. To donate items, Pratschner is available 24/7 to pick up donations. Donors must contact her for donations and donations cannot be dropped off or left at the church. Donations to the center are tax-deductible.